Office 365 Exchange Online Plan 1 is great for hosting email on your personal domain. At £36 a year, aka £3 per month you get an enterprise grade Exchange inbox. So basically if your paying Microsoft to host email for your personal domain, you then can’t associate your Microsoft account with any email address on that domain, or can you? Historically you could, however that changed in 2016 as this was apparently causing a great deal of confusion in some business between what an Office 365 account and Microsoft account was, so Microsoft blocked the ability to associate both with the same email address. However I know things work fine if you do have both a Microsoft account and an Office 365 account associated with the same domain as i’ve been doing it for years with my personal eu domain. However due to the UK leaving the EU i’ve had to switch over to a .me.uk domain, which is where i first discovered this issue. 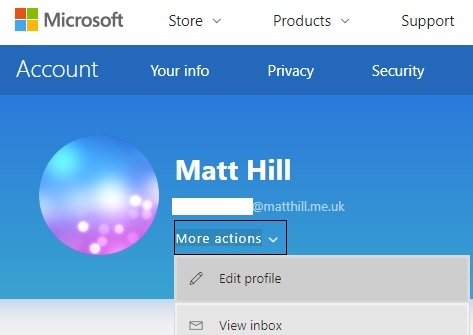 However after a bit of messing about I did discover a way to associate both a personal Microsoft account and an Office 365 account with the same domain where email is hosted with Office 365 exchange. When you have deleted the domain you then need to wait a few hours for this to propagate to all Microsoft servers. During this time you need to host email for the domain you wish to use in Office 365 elsewhere, if you have a webhosting account with gives you a few email inboxes this would be ideal. My domains DNS were hosted with Cloudflare, so I did have to temporary move them back to Namecheap to do this. If you do get the “You can’t add a work or school email address as an alias to a personal Microsoft account. Please try another.” then you need to wait a bit longer as it hasn’t propagated to all Microsoft’s servers that your domain is no longer hosted with Office 365. You should now be able to add your desired email address to the Microsoft account you wish to also use Office 365 Exchange Email with and receive the confirmation email thanks to the email forwarding we setup above. Once you have received the confirmation email you can set your new email address as your primary alias. Now everything is set for the Microsoft account you can add your domain back to Office 365 and change your DNS settings to allow Office 365 Exchange to host your email, still having your Microsoft Account associated with the domain you are hosing email for on Office 365. Hopefully this helps someone out who wishes to use Office 365 Exchange to host email for their personal domain. I can totally understand why Microsoft have blocked you from having both a Microsoft account and an Office 365 account hosted with the same domain, as it can get confusing if you don’t understand the difference between the two. However someone like me who just wants to use Office 365 Exchange to host their personal email I see no issue with this, everything has worked fine for me when Microsoft actually allowed this to be done. What this does show is Microsoft really need to allow some official way for Office 365 / Microsoft accounts to be linked without causing confusion.